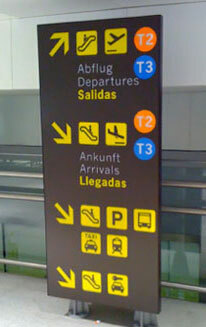 Malaga Airport - car hire, departures and arrivals, transfers and useful AGP info. Malaga airport (AGP), situated just 10 km southwest of the city centre, is an international passenger airport and the most important airport of Andalusia. The airport is well connected with both Malaga city and with some of the main tourist areas on the western Costa del Sol such as Torremolinos, Benalmadena and Fuengirola through the suburban train with a current frequency of every half hour. The andalusian coast also has an excellent Mediterranean Highway and Malaga city is connected with Madrid since 2007 by the high-speed train AVE that runs between the two cities in two and a half hours. The airport was inaugurated in 1919 and nowadays, with an annual total of approximately 13 million passengers, it occupies the 4th place in the ranking of Spain's most frequented airports. Obviously, the airport is essential for the tourism in Southern Spain and due to the constant increase in passengers, Malaga airport is being amplified (second runway, subway connections), which can be seen on the Malaga airport map. The extension was finished in 2010, providing Malaga flights to over 35 million passengers. The new terminal T3 is a spacious and bright building next to the old T2, with which it is connected directly via a gateway. The passenger area has a wide range of businesses of all kinds, some being particularly outstanding as for instance the first airport shop of National Geographic or a Haute Cuisine Restaurant. In order to handle the large tourist afflux, there is also expected an increase in frequency in the suburban train, as well as Malaga airport transfers, buses and Malaga airport car hire services. Malaga is an international destination which is why there are so many airlines travelling to the Malaga AGP airport and now with the new runway finished, it’s expected to double the capacity of operations towards the end of June, from the current 37 to about 65 per hour. Malaga airport is the third in the country by volume of passengers and is expected to continue growing over the next few years. The amount of companies that we’ll find could be quite overwhelming, however our prices are compared to our competitors every day so that our clients always find the best possible price. If you can’t find your car rental at the airport by browsing online, we recommend you stay away from the brokers. They don’t have their own vehicles and looking to offer a low price, you’re bound to find unpleasant surprises in small print. We offer the final prices without surprises, assured and totally guaranteed. The suburban train has a stop at the airport and goes from the centre of Malaga right through to Fuengirola. It’s a good option for those who don’t need to hire a car and their destination is located nearby the station. Otherwise the best option is a Malaga airport transfer or hire a car.